A caffè sospeso (Italian: suspended coffee) is a cup of coffee paid for in advance as an anonymous act of charity. The tradition began in the working-class cafés of Naples and has spread around the world. Someone who had experienced good luck would order a sospeso, paying the price of two coffees but receiving and consuming only one. A poor person enquiring later whether there was a sospeso available would then be served a coffee for free. There are many variations on the central idea but in essence, a “suspended coffee”– is a cup of coffee that a customer buys anonymously for someone who can't afford to buy one themselves. The customer pays for the coffee in advance and the cafe “suspends” it, later making the coffee for whoever requests it. More and more cafes, restaurants and bakeries have begun offering suspended coffees. There's been no shortage of customer donations in that time. The next step: to try and raise awareness so the coffees can get distributed to those they are intended for. Gusto Café has decided to join in the bandwagon and support this great idea. We’ve been working on our café for the past year or so and have tried to be aware of some of the needs around us. It’s sometimes quite difficult as it’s much easier to be caught up with one’s self/ needs. 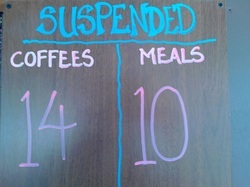 We don’t want to only serve up suspended coffees but also suspended meals as well. For this to happen we need to start putting our best foot forward, stop lollygagging and also start acting on what we strongly believe and desire to see happen in our community. We’ll be working in conjunction with several charitable organizations. We hope that you will join us in this effort to transform our Island.